This was published as a Wall Street Journal Think Tank column on September 24, 2014. Everybody is for wellness, including corporate America. 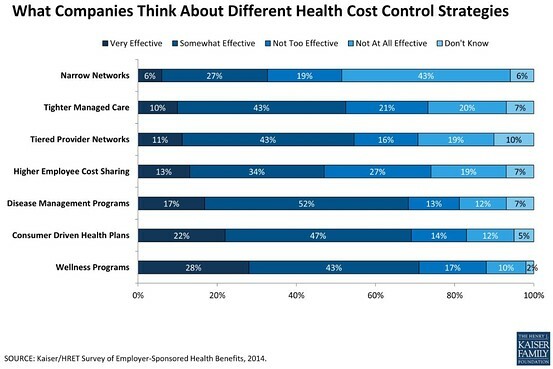 As the chart above shows, wellness programs–as varied as gym memberships, lifestyle coaching, flu shots and vaccinations, nutrition counseling and biometric screening, and other weight-loss efforts–are corporate America’s favorite strategy for health cost containment. That’s right, cost containment–despite the fact that evidence of wellness programs’ effectiveness is mixed when it comes to holding down costs and actually improving health. The appeal of wellness programs has much to do with the popularity of wellness benefits among employees (and a belief that they can reduce absenteeism and improve productivity). The roughly $6 billion wellness industry aggressively sells products–and wellness programs are a far easier cost-containment strategy to sell to employees than higher cost sharing or narrower provider networks. Surveys show that workers across the country really like the idea of wellness benefits, with a whopping 80% approving of the practice. But when companies require workers to pay higher premiums if they do not participate in wellness programs, employees jump off the bandwagon, with 62% opposing the idea and 72% opposing a link between premiums and meeting personal health goals. Thirty-six percent of large firms and 18% of smaller firms offer these kinds of incentives. Employers have been investing in workplace wellness programs despite little in the way of rigorous evidence of effectiveness. Workers are happy to go along so long as they see wellness as a benefit that improves their sense of well-being, rather than an effort to intrude on their privacy or make them pay more for health coverage. It’s possible that results will be stronger as programs are refined and more evaluations are done. Some elements of wellness programs may prove more efficacious, and less costly, than others. Ultimately, employers will demand more proof that these programs work, and workers may resist bigger sticks to get them to participate.